There’s a song in the musical “Rent” about how when you break up with someone, the world still functions as normal, and how that makes no sense. The grass still grows, the cows still moo, etc. Leaving a place feels very similar. I got on the airport shuttle in Apia tonight, and there was a familiar DJ on the radio, settling in for another night of Akon song after Akon song. The row of nightclubs on Beach Road was at a simmer, getting ready for another night. Doesn’t everyone know I’m leaving? Don’t they know this is the first time I’ve been off the island since I’ve been on the island? It’s a big deal. But everything’s the same. At the airport, I felt a little cool for conducting my entire encounter with the outbound Customs agent in Samoan. 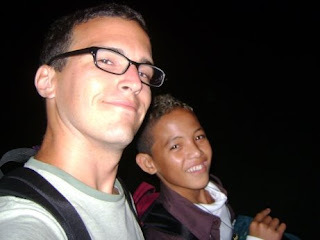 He noticed my occupation and asked when I was coming back and noted, “Tu’ua le ‘āoga,” School’s out. I smiled, gave him a consolatory “Seki a,” and moved on. Peace Corps life makes menial American tasks bizarrely difficult. I was never a jetsetter, but I did a fair amount of air travel during and after college. When LAX implemented a different security line for season travelers, I felt justified waiting in it. But now I’m just a moron. My bag got flagged going through security. “Do you have any liquids or gels?” The lady (robot?) asked me. She pulled out the toothpaste. And the shaving cream. And the sun screen. She told me the toothpaste was the only one I could take as long as it was in a sealable bag. Can we stop and talk about the sealable bag? Can someone explain to me why this is a rule? Is a Ziploc bag going to stop me from using my toothpaste as an explosion device? Is the International Air Safety Board worried about toothpaste leaking out of the tube and getting all over the other stuff that is stowed in that part of my backpack? Seriously. Does the Ziploc lobby have that much sway? Suffice it to say, I had no Ziploc bag. No teeth-brushing for me for the next 12 hours. Oh well. As always, while I was in line to board the plane I ran into a kid, Sue (pronounced Su-ay), who attends my school. He’s one of the smallest year 9s, and so I was able to recognize him at the same moment he recognized me, which was nice. He was happy to see me and we talked about why we were going to New Zealand. And then he got a worried look on his face. “You’re coming back, right?” It was very cute. We took a photo as we walked across the runway (Picture above). Luisa’s flight wasn’t scheduled to get in until 4 hours after mine, so I spent the night in the baggage claim area in the Auckland airport. I did a New York Times Sunday Crossword and read my book. The only real problem is that it’s so damn cold here! It probably has much to do with how I’ve just spent 7.5 months in the Tropic of Capricorn, but still… It’s like the walls at the Auckland airport are made of tin. Don’t they have insulation in this country? Do they know about heaters? Maybe the Peace Corps should think about opening a post here. We could teach them some things. Luisa got in fine, and other than some bumps with security (My Customs code was for 23 May, but I exited the airport after they switched codes to 24 May), we got out fine. It’s so damn cold though. 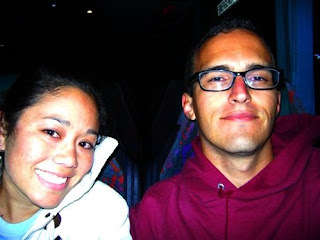 Luisa and me on the bus at 6:45 a.m. 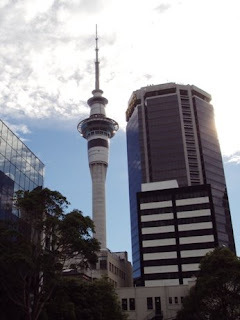 The Sky Tower in Auckland, tallest building in the southern hemisphere. 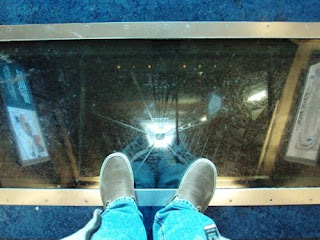 The elevator that goes to the top of the Sky Tower has a glass floor so you can see all the way down the elevator shaft as you ascend. 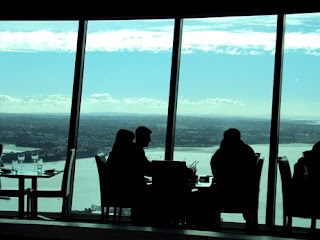 The rotating restaurant at the top of the Sky Tower. 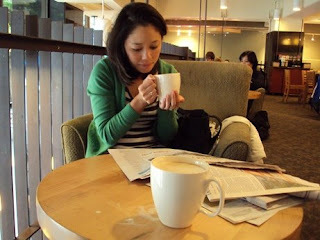 As promised, a trip to Starbucks. We're glad to hear you're safe in New Zealand! It's nice to see a picture of you and Luisa together again. Good thing you got such a good deal on long pants and a hoodie at the thrift store. I agree...very nice to see you safely together. I hope you enjoy your time away but so nice that you will be missed. I love the masthead change.